Until recently I never paid much attention to Gormiti, a toy and cartoon series that originated in Italy and revolves around a variety of fierce-looking, nature-based characters (for example, battling creatures of the forest, air, sea, etc.). That's probably because I never realized the figures came in mini monochromatic versions different than the slightly larger, painted ones I had seen in photos. If you read this site regularly, you know I'm all about the mono minis and can sometimes glance over painted figures. Not too long ago I won a whole bunch of these smaller "Gormiti Micros" as a prize in a contest over at LittleRubberGuys.com, and I'm so glad I did. It turns out they're much more interesting figures than I had ever noticed. 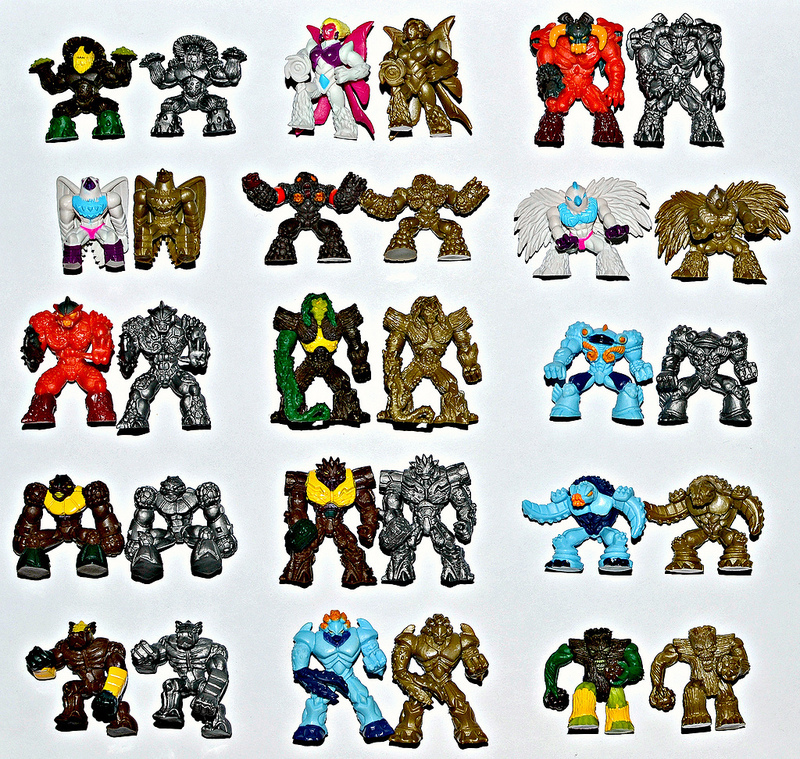 The Gormiti Micros were released around 2010 from Italian company Giochi Preziosi and marketed in the U.K. by Corinthian. I'm pretty sure they were never available outside of Europe (but someone please correct me if I'm wrong). The set consists of 15 different sculpts that each come in painted, monochromatic gold, and mono chromatic silver versions. Two figures came packaged in a single box with jelly beans. The box actually refers to the silver and gold figures "really cool." I agree! To the right you can see all 15 sculpts in painted and mono form, and below are scans of a Gormiti Micros box as well as a pamphlet that came inside showing all of the characters to collect. The figures are around 1" tall and made of a firm, but not brittle, plastic. It's impressive how much detail the creators of these toys got into the figures, considering they're so small. All of the figures are feature a lot of fantastic texture, from the feathers in the wings of the Solitary Eagle to the crevices and bumps on the Lord of the Forest's wooden limbs and tendrils. The details pop especially well on the silver and gold mono versions, where you can see all the miniscule elements most clearly. 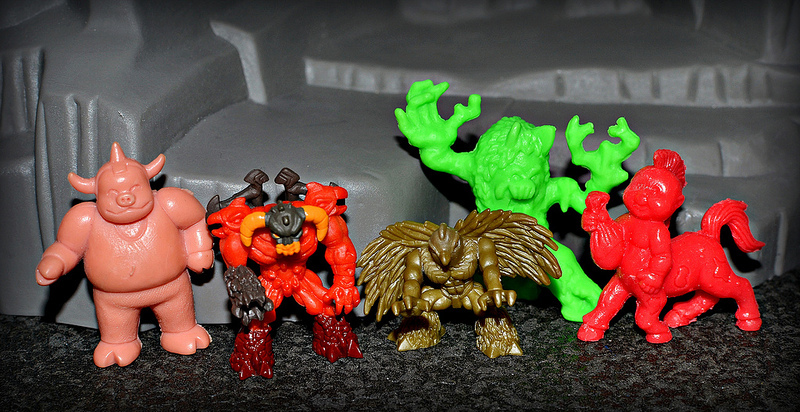 To give you a better idea of the size, here's a comparison shot of some Gormiti Micros alongside MUSCLE, Monster in My Pocket and Garbage Pail Kids Cheap Toys figures. I was definitely glad to add these guys to my collection. What about you? What do you think of them? Do you have any Gormiti in your collection? 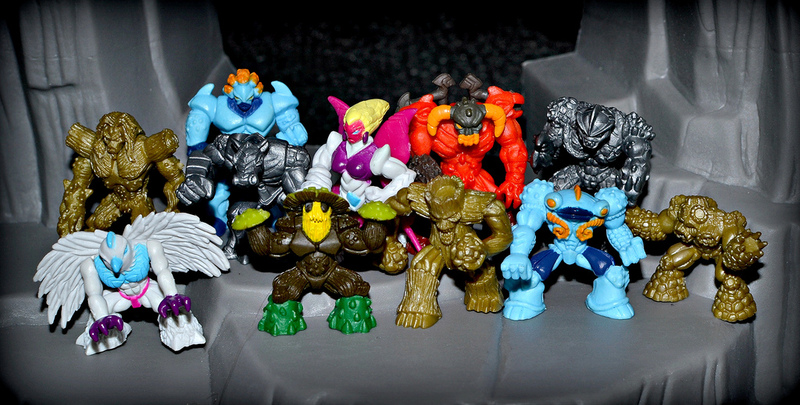 I had to restrain myself when these came out because they so reminded me of Battle Beasts! I didn't really think about it, but they are pretty Battle Beast-esque! I bought a few a while ago and can only report that the jelly beans were pretty vile...that sort of too surgery ones that makes it hard to tell between flavours and gives you a sore throat if you have lot! Haha, my packs were already opened so I didn't get any of the jelly beans. I guess candy that comes with toys is pretty bad more often than not. These guys are cool, I've never come across them before. They're definetely right up my alley. I also didn't realize that Little Rubber Guys had contests. I need to check in there more often! Yep, there's usually 1-2 contests going on each month. I won these from a contest where you had to make LRG-based art in Microsoft Paint! I just got a bunch of these mono figs and I'm so impressed with the detail. They're so intricate and tiny!